Stocks are spooked by a lot of things, but now the dollar's quick move higher has investors worried about new pressures on corporate profit margins and earnings growth. The dollar index has jumped 1.4 percent in the past week and is now at a 17-month high. "It could be a challenge for the stock market in the fact that about 40 percent of the S&P 500 earnings are generated from outside the United States," one strategist says. 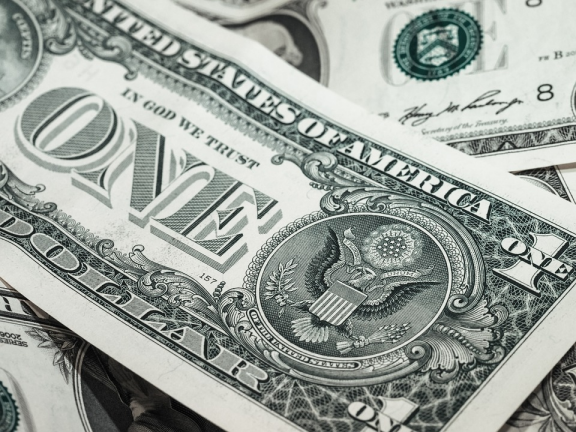 The dollar's strength Monday was largely attributed to weakness in the British pound and euro because of negative Brexit news and concerns about Italy's budget. But the dollar has also been rising on trade war concerns, rising U.S. interest rates and weaker growth rates outside the U.S.
"It could be a challenge for the stock market in the fact that about 40 percent of the S&P 500 earnings are generated from outside the United States," said Michael Arone, chief investment strategist at State Street Global Advisors. "As the dollar strengthens, that has certainly created risk to those earnings. 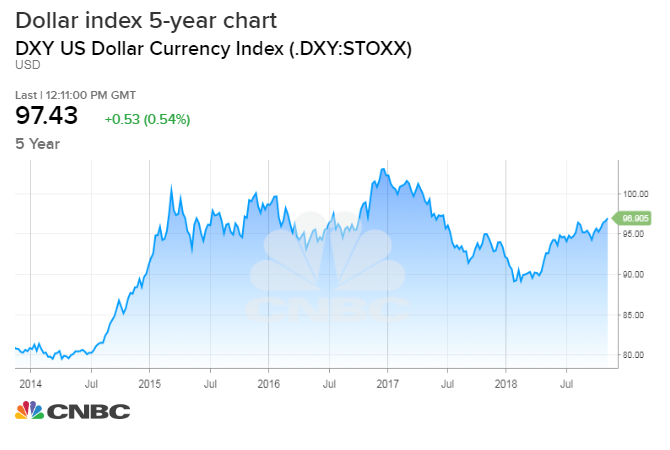 Another thing that could be a risk is, as the global economy has been slowing this year, the rising dollar poses a problem for many countries outside the U.S., and that has contributed to the slowdown in growth. The question is whether the U.S. economy can withstand a slowdown in global growth, and I don't think it can in the long run." Marc Chandler, chief market strategist at Bannockburn Global Forex, said the dollar in recent sessions has been getting a boost from the Fed. After last week's meeting, the Fed's statement indicated a rate hike is coming in December and several more could be in store for next year. "Broadly, the dollar is at its best levels of the year," said Chandler. "We just got done with earnings season, and many people are afraid earnings peaked, and the stronger dollar just adds to that." Boockvar said the decline in Apple after a key supplier reported slower orders was one catalyst for Monday's decline in stocks. The market was also still reacting to Friday comments from White House trade advisor Peter Navarro, who said any trade deal will be on President Donald Trump's terms. "It's another clip to earnings," said Boockvar, adding the market was already anxious about higher interest rates. "You've had low wages. That's reversing. Now you get clipped via higher costs from tariffs, higher transportation costs, and you throw in the stronger dollar. You can make a strong argument that the third quarter was the peak for profit margins." Boockvar said corporate profit margins peaked at lower levels in the last cycles. They topped out at a high of 9.5 percent in the mid-2000s, and at 7.75 percent in the early 2000s, he said. "[The dollar] was certainly a factor all through the third-quarter earnings for multinationals. We hear as an excuse that it was the stronger dollar, and the dollar is still below where it was in 2016, even with all these rate hikes," said Boockvar. "I'm not going to believe the dollar is going to run away, but it is a likely factor here." Among the companies complaining about dollar headwinds last quarter were Apple and FANG names like Alphabet, he said.